Pokemon X and Y were announced over the break, so I had to take the chance to draw the new starters upon the comic’s return. I’ve noticed Fennekin seems to be the most popular choice, but I’m a fan of the funky-looking Froakie! This particular strip is unusual in that the concept and gag are sort of on a timer. Once the evolutions of these starter Pokemon are officially revealed, it’s gonna be a little weird in hindsight (unless they actually look like that)! That almost made me not do it, but then I thought that the core idea of a Pokemon’s evolution carrying on undesirable physical traits is kind of a neat one, and one that wouldn’t really be all that fun to explore with evolutions we already know of (i.e. Dragonair trainer is displeased with Dragonite…we’d already see that coming). So really, I can only approach this kind of idea at this small window in time, where we know how the starters look but not their evolutions. 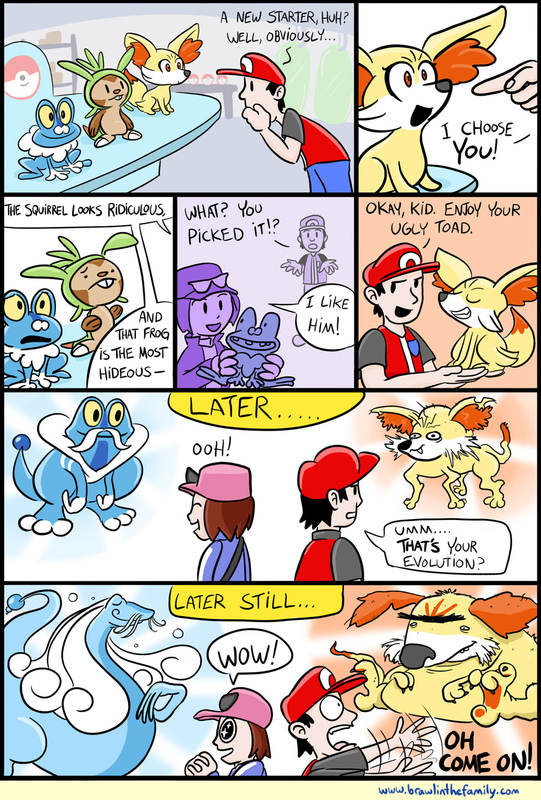 And let’s face it, the evolutions are really the ones we’re going to be stuck with. So that was my weird little conundrum with this comic that was hopefully interesting enough to warrant reading a paragraph on. Oh, and regarding the game, I’m pretty excited for it! In fact, it would be the first Pokemon game I’ve picked up since Gold, and I’m looking forward to finally jumping into that world again this October.